Heater Sports' newest pitching machine, the Deuce-95 Two Wheel Curveball Pitching Machine is, by far, the most economical two wheel pitching machine that can throw anything a Major League pitcher can throw. Priced at more than $600 less than any other two wheel pitching machine that can throw 95 MPH, this pitching machine is a true steal at this price point! Practice hitting fastballs, curves and a variety of other breaking balls with the Heater Deuce-95 2 Wheel Pitching Machine. This pitching machine includes an automatic ball feeder which holds 12 baseballs so that you can practice whenever you want, without needing another person. Once the automatic feeder is on, balls are pitched every 10 seconds. 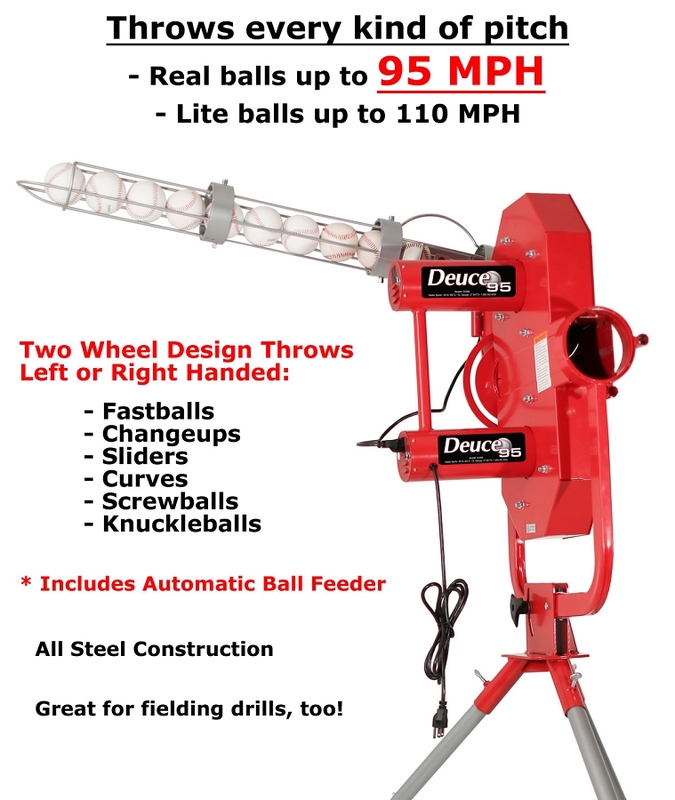 The Deuce-95 2 Wheel Pitching Machine allows you to adjust two wheels independently for duel speed control to throw a variety of pitches up to 95 miles per hour! The innovative pivot head design means you can simulate throws from left or right handed pitchers as well as throw 3/4 breaking balls. Along with the pivot head design and variable speed control, this pitching machine has an adjustable pitch height, so you can customize pitches to work on trouble hitting areas. The quality design of the Heater Deuce-95 2 Wheel Pitching Machine makes it durable and adaptable. This pitching machine's legs are built of tubular steel and are made to last. Encased in a steel housing, thes fully enclosed wheel means maximum safety for you and those around you. It can plug into an outlet using the included A/C adapter and mounted on the optional PowerAlley batting cage or Xtender Home batting cages for long term practice right in your own backyard. The Deuce-95 2 Wheel Pitching Machine includes a 30-day money-back guarantee and a 1 year limited warranty to ensure your satisfaction. PLEASE NOTE: Although the Deuce-95 2 Wheel pitching machine can throw regulation baseballs, it is highly recommended that you use Heater Sports approved pitching machine balls. They fly straighter, last longer and do far less damage to pitching machine wheels than real baseballs do. 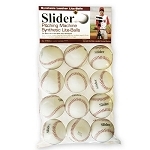 A list of balls for the Heater Deuce-95 pitching machine is provided in the Approved Balls tab, above. Q: How durable is the Deuce-95? What replacement parts are available, at what cost? What is the shipping weight and size of the container? A: The Heater Deuce 95 pitching machine is all steel, so it is certainly a durable machine. It has a one year manufacturer's warranty. For the most part, the only things that might need to be replaced on the Heater Deuce 95 at some point in time are the wheels, the motor and the speed control circuit board. Wheels cost $80 apiece, the motor costs $50 and the speed controler costs $50. The shipping weight is 90 pounds and the container size is 30.75" x 21.25" x 16.25". 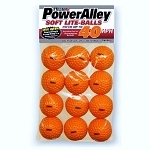 Q: The description says it throws lite balls at a higher speed, but the approved lite balls are listed as 30 and 60 mph. Which lite or foam balls throw at the full or higher speed? A: The Heater Deuce 95 is Heater Sports' top of the line pitching machine. It can throw real balls or real weight dimple balls up to 95 MPH. Yes, it can throw lite balls, too, but they would be even faster at the top speed. Sorry, but we do not know how much faster. The Deuce is not a machine people normally use lite balls with - especially at the fastest speed. Typically, people only use lite balls with young children who are afraid of real balls or who need to use a machine in a more confined space - something that is certainly not typical when buying a pitching machine capable of throwing real balls up to 95 MPH. 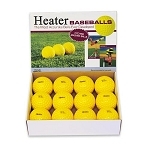 Heater Sports' lite balls are rated at the top speed that their lite ball pitching machines throw. The 60 MPH balls correspond to the top speed of their lite ball pitching machine. The 40 MPH balls will not fly as fast at that machine's top speed. Bottom Line: 60 MPH balls pitch faster than 40 MPH balls. Q: Can the ABF be removed easily? Will this machine chew up regular baseballs? A: The automatic ball feeder does not come pre-assembled on the pitching machine. It is part of the assembly that you will do after receiving the machine. Therefore, it's just as easy to remove it as it was to attach it. The Heater Deuce-95 does not chew up real baseballs any more than any other wheeled pitching machine does. That said, ALL pitching machines with wheels will eventually rip the covers off of real balls. That is because the gap between the wheels is set about a 1/4 inch less than the diameter of the ball so that the ball gets pinched between the wheels before shooting out the other side. Real baseballs have covers that are glued onto them and pitching machines exert significantly more pressure on the ball than a human hand does. Eventually, the tremendous pressure breaks the glue, the covers get soft and then get ripped off by wheels. If you are going to use real baseballs, please know that they will never be as accurate as dimple balls. Part of that is due to the aerodynamics of a dimpled ball (there's a reason golf balls have dimples on them) but mostly it is because the raised seams catch the wheels differently every time. A real pitcher gets different movement on a pitch by gripping the seams differently so it makes sense that balls will have different spin characteristics leaving a pitching machine when the seams are in a randomly different position and that different spin will result in pitches not being as accurate. Finally, as it says in the owner's manual, if you are going to use real balls, only use the highest quality leather balls. Synthetic balls or balls with a protective coating will not pitch accurately and will also leave a residue on the wheels, making it difficult to impossible for them to grip other balls after repeated use. 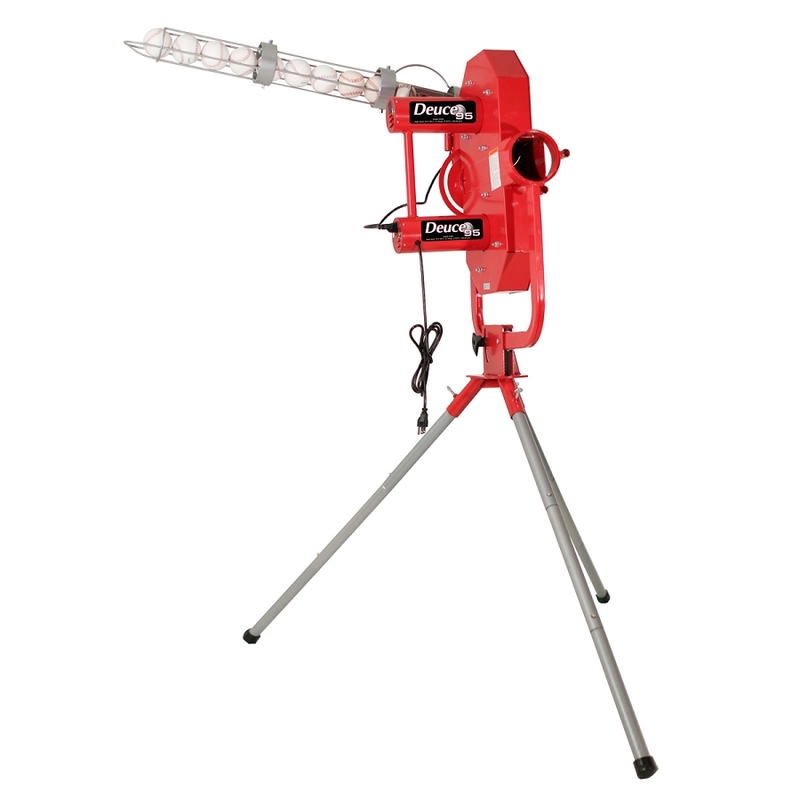 To ensure your satisfaction, the Heater Deuce-95 Curveball Pitching Machine includes a 30 Day Money Back Guarantee. 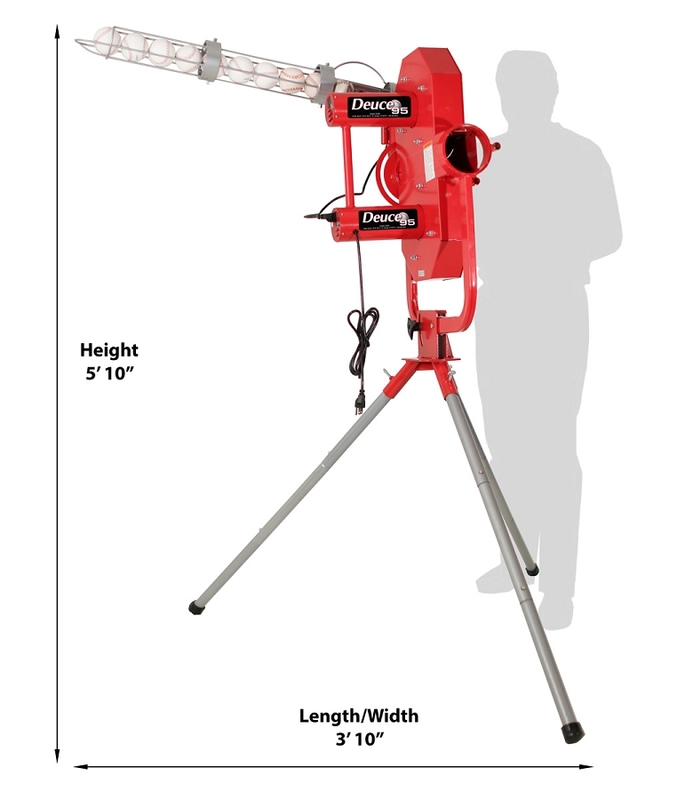 Heater Deuce-95 pitching machines are also backed by a Full 1 Year Warranty that includes repair, replacement and labor. No matter where you order a Heater Deuce-95 Pitching Machine from, NOBODY actually stocks them; they all ship directly from the manufacturer's warehouse located in St. George, Utah. Therefore, the shipping time frame is exactly the same no matter what website you order from (we hope that it is this one!). Heater Deuce-95 2 Wheel Pitching Machines typically take 2-4 business days to ship from the time you place your order. They ship via Federal Express (FedEx) Ground and could take anywhere from a day or two to a week to get to you AFTER being shipped, depending on your proximity to their warehouse. We will notify you of your tracking number the moment we receive it from the manufacturer's warehouse.